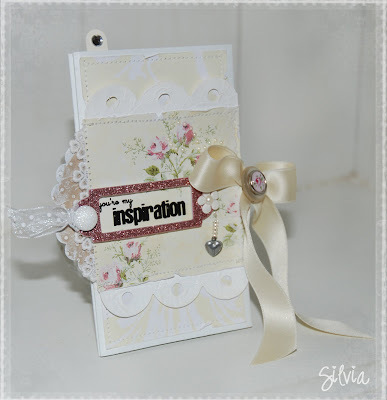 Shabby Chic Silvia: This is for YOU guys! It's been crazy around here lately, and I've been the worst blogger. So last night I decided to make YOU a card. leaving me kind words! You ARE my inspiration! Utrolig vakkert kort - og tusen takk for din inspirasjon! You know what Silvia, sometimes life just gets in the way. Thanks for the caeds it is simply beautiful as is all your work. Take Care and look forward to seeing more of you work soon. Life is hectic sometimes!! Thanks for the terrific card!!! Beautiful as always!! Have a great week!! Love seeing your creations, they make me smile! What a breathtaking card....definitely worth the wait! Åååå utrolig vakkert og delikat kort!!! Takk for all inspirasjon som du gir. My english is very bad, but your blog is very very beautiful. 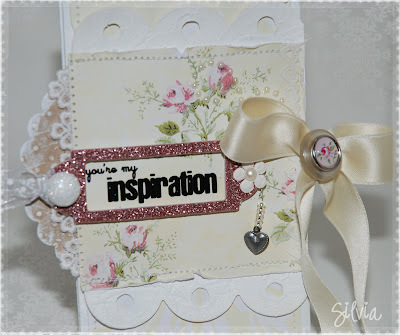 so beautiful!i love your scrap! I love really what you do ! It's so cute ! I've referenced your blog on a new french blog for shabby scrapooking . I'll write a message about you . I love your blog. It is full of inspiration. If you don't mind me asking, do you remember the company behind that beautiful floral paper on your card?